Kari Goebel is the Marketing and Communications Intern based out of Grameen Foundation’s Technology Center in Seattle, WA. As a full-time intern and volunteer, I have had a lot of time to reflect about life on a budget. I am constantly making decisions about how to keep my spending low and maintain a positive savings-account balance. Yes, I should start taking the bus to work so I do not have to pay for parking or gas. No, I should not go out to lunch, but pack some leftovers from home instead. Yes, maybe it is a good idea to move in with my parents, versus paying rent on an apartment. No, maybe I do not need a fancy espresso this morning. But even though times have been tough for me financially, my experience is nothing like some of the poor and poorest worldwide, some of whom live on less than $1.25 a day! (My bus ride alone costs $5.50, round trip!) However, Grameen Foundation works to fight global poverty and help the poor lift themselves out of poverty – like in the case of Bosede Ogunleye of Nigeria. In the past, Bosede only earned about $0.26 per day selling filtered water on the streets. As a single mother of two children, she was unable to provide daily meals to them. Bosede went to a local microfinance institution and took out a loan for 10,000 Nara (US$90), which enabled her to invest in other products to sell. As her clientele grew, she was able to purchase a freezer and a generator, which enabled her to start selling frozen fish and meat. Eventually, Bosede grew her household income more than six-fold, earning nearly $4.50 per day and moving her family to the Nigerian middle-class bracket. Now Bosede can pay her children’s schooling fees with ease and no longer has to worry about if she is will to be able to feed her kids. I may be on an extremely tight budget, but this December, I will choose to give my family a gift from Grameen Foundation that helps poor people around the around the world, like Bosede, move out of extreme poverty. (For once, I hope my family does not read this blog or their holiday gift will lack any surprise!) During this holiday season, I ask you to consider honoring a friend, loved one, or family member with a gift of hope and opportunity to the poor and poorest. Let’s fight global poverty together! Discussions of the microfinance crisis in Andhra Pradesh, India, have, so far, overlooked one area that might have a played a contributing role: human capital management practices. Grameen Foundation’s Human Capital Center focuses on improving these “people practices” at microfinance institutions (MFIs). In this piece for CGAP’s Microfinance Blog, Peg Ross, director of the Human Capital Center, discusses the critical role frontline staff can play in improving MFIs’ overall social and financial impact. Read more at the CGAP blog. Jason Hahn is the Information and Communication Technology Innovation (ICTI) Development Manager at Grameen Foundation. The ICTI team develops, tests and advances mobile phone products and services in Uganda, Indonesia, and Ghana to improve healthcare, farming, banking, and more. After we launched our Community Knowledge Worker (CKW) network in Uganda, I was reviewing a budget report and came across a “babysitting” entry. Thinking this must be an obvious mistake, I contacted our local finance person for an explanation. I discovered that we did pay for babysitting as some of the CKWs we were training were mothers who would not have been able to participate unless we paid for child care. It makes perfect sense now and is a good example of a practical step you can take to ensure that women and men access your programs. 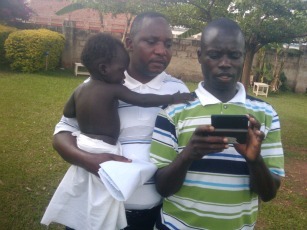 Hosea Sempa from our training team holds a baby so the father (in picture) and mother (out of picture) can participate in the training. At Grameen Foundation, we’ve learned first-hand the importance of doing what it takes to strive for gender equity in our work. Ensuring that women have equal access to the actionable agricultural information we provide through our CKW network is not just a “feel good” action for us. It is also one of the most practical steps we can take to achieve our goal of improving farmers’ livelihoods through access to information. In Uganda, women do 85% of the planting, 85% of the weeding, 55% of the land preparation, and 98% of all food processing. This may explain why 90% of rural women in Uganda work in agriculture, compared to 53% of men. According to the Food and Agriculture Organization (FAO), women in rural areas produce at least 50% of the world’s food. While women are hard at work on farms, we also know that many women do not have access to mobile phones. According to the Women and Mobile Report by the GSMA and Cherie Blair Foundation, women are 24% less likely than men to own a mobile phone in sub-Saharan Africa, and women in rural areas and lower income brackets stand to benefit the most from closing the gender gap in mobile phone ownership. Ayesha Abbasi was an intern on Grameen Foundation’s Marketing and Communications team from August through November of this year. A senior at American University’s Kogod School of Business, Ayesha wrote this blog post as she was preparing to graduate in December. As I walked into the Grameen Foundation office in Washington, DC on my first day back in August, I remember being captivated by the vibrant images of microfinance borrowers from around the globe. One by one, I closely examined the portraits hanging on the walls, trying to understand the relationship between the organization and these individuals with smiles of satisfaction on their faces. Now, having been at Grameen Foundation for more than three months, I am not only aware, but wholeheartedly passionate, about the organization’s noble influence in underprivileged communities around the world. My role as the Marketing and Communications Intern this semester has been a rewarding experience through which I’ve gained invaluable insights into the microfinance sector. Despite its challenges and complexities, the underlying principle of microfinance – channeling small amounts of funds to those who can put it to a productive use and thereby achieve a better economic and social condition –continues to make it extraordinary way of helping the poor. Through its innovative, strategic approach of reaching the poorest of the poor, Grameen Foundation is creating a positive ripple effect of microfinance’s benefits in diverse regions. While doing research and writing stories, I learned that the organization’s work goes above and beyond fostering entrepreneurial spirits among the poor. It’s amazing how, despite their harsh situations, these poor individuals maintain a positive attitude, dedicated work ethic, and willingness and desire to be entrepreneurs who think outside the box. All they need is an opportunity – a chance that Grameen Foundation and its partners provide – to take their ideas and turn them into action. In a global society that is becoming increasingly competitive and beset with economic disparities, the presence of institutions such as Grameen Foundation and its microfinance partners helps to eradicate inequalities by enabling the poor to advance. So how does Grameen Foundation empower the poorest of the poor? Through my time here, I find it is the passionate employees and unique organizational culture that make this possible. Grameen Foundation is a dynamic, fluid organization with free-flowing ideas and collaboration between all individuals, who are dedicated to providing the poor with access to small loans, vital information, and viable business opportunities. All staff members work collectively to achieve the mission of alleviating worldwide poverty. While supporting the Marketing department, I have come to truly understand the Grameen Foundation brand and align myself with its core values and mission. Having come to the end of my internship, I am so grateful for all the new knowledge I have gained by contributing to Grameen Foundation’s microfinance- and technology-focused initiatives. Alex Counts is president, CEO and founder of Grameen Foundation, as well as the author of several books, including Small Loans, Big Dreams: How Nobel Prize Winner Muhammad Yunus and Microfinance are Changing the World. The allure of microfinance – that it is a way to empower the poor, to give them a hand up rather than a handout – and the successes of the Grameen approach in Bangladesh eventually attracted worldwide attention to Prof. Yunus, culminating in a number of prestigious awards in the last several years, including the Nobel Peace Prize, the Presidential Medal of Freedom, and the Congressional Gold Medal (Prof. Yunus is one of only seven people in history to have won all three awards). 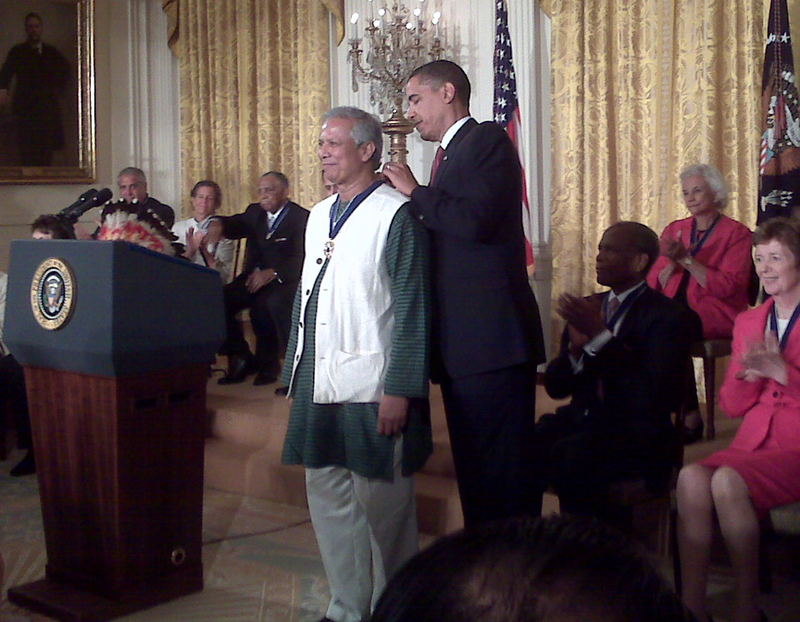 President Barack Obama presents Professor Muhammad Yunus with the Presidential Medal of Freedom during a special White House ceremony in August 2009. Unfortunately, the attention that comes with success also brings detractors. From the beginning, Prof. Yunus and other supporters of the Grameen approach have had to fight powerful vested interests threatened by the empowerment of the poor. In addition, he – and the other Grameen-related organizations, including Grameen Foundation – have had to work hard to educate people about the approaches to microfinance that put the poor client first, as well as respond to those who have honest disagreements with the Grameen approach. All along, we have realized that these challenges “go with the territory,” and that the best way of dealing with those who disagree with our approach is to continue our work promoting the right of the poor to have access to financing, information and business opportunities, while simultaneously promoting the value of a double-bottom-line model to the microfinance institutions (MFIs) that serve them. Essentially, this media-manufactured controversy is about a simple transfer between two organizations that was reversed because of an honest disagreement about how best to manage resources meant to serve the poor, and was resolved more than a decade ago to the satisfaction of all parties involved. However, though no responsible reporting on this – including from the maker of the documentary itself – has accused Professor Yunus of personal corruption or wrongdoing, that hasn’t stopped the media from running misleading headlines or various commentators from making continuing and ever-more-personal attacks. [On Dec. 17, Rehman Sobhan, a former chairman of Grameen Bank’s Board of Directors who says he is “no starry eyed fan who believes that micro-credit is a magic bullet to end poverty,” wrote a balanced overview of the controversy, asking his fellow Bangladeshis to base their opinions on fact rather than rumor and media hype.] Most recently, the government of Bangladesh has stated its intention to conduct an investigation and Professor Yunus has welcomed that. We live in a world of 24-hour news cycles enabled by a global network – the Internet – capable of transmitting information (as well as misinformation!) at near light speed with the touch of a button. The price of leadership is the attention it brings, both deserved and undeserved, and Prof. Yunus is a remarkable leader who has not been afraid to speak his mind and challenge the status quo. He’s also a man of the highest ethical values, who I know has never profited in any way from his position as managing director of Grameen Bank or his relationship with any of the Grameen family of companies. Grameen Foundation staff remains in contact with Prof. Yunus and his staff about this situation; as things develop, we will keep you informed. On Nov. 25, Thanksgiving Day in the U.S., I joined Vikram Akula, the founder of SKS Microfinance (India’s largest microfinance institution), for an interview on “Talk of the Nation,” which airs nationally on National Public Radio. This 40-minute interview followed our 90-minute debate at the Asia Society a few weeks earlier. I must say, my heart goes out to Vikram, since for him both sessions took place after midnight his time (he participated remotely from India). The host and especially the callers asked some direct questions about interest rates and private benefit for SKS’s management, including Vikram himself. In response, Vikram seemed evasive at times, prompting follow-up questions. At one point, I answered on his behalf, saying that his stock options were worth about $60 million based on publicly available documents and the share price at the time of the offering – facts that he did not challenge. I was not trying to embarrass him, but I thought the question deserved a direct answer. Several times I raised the issue of the ways that the IPO had likely provoked the regulatory backlash that is endangering the entire microfinance sector in India today. Vikram basically ignored the point. This echoed some of our earlier exchanges. During the Asia Society debate, I said that I was disappointed that SKS (a) had not embraced an internationally accepted social performance tool such as the Progress out of Poverty Index™ (a point I returned to during the NPR interview), (b) had not undergone a social rating, and (c) had not commissioned a randomized control trial (RCT)-type study of its impact. My thesis was that taking these steps would represent a true embrace of being a double-bottom-line MFI, rather than one focused exclusively on maximizing profit. Vikram responded that there in fact had been an RCT study of SKS that indicated income growth of 45%. I indicated surprise about this study since I had not heard of it previously, and after the debate I emailed him asking that he send it. Weeks passed and I did not hear back. In the aftermath of the NPR interview, Vikram and I exchanged emails congratulating each other despite the fact that we have some fundamental disagreements – disagreements that came out on the air. Having his attention, I followed up on the issue of the study and the following day a colleague of his sent a link to the report, which can be found here. In several respects, I was underwhelmed by it. Rather than being a study of SKS’s impact, it covered 25 MFIs and it is impossible to know whether or not SKS’s clients were among those who experienced income gains. Secondly, after consulting two experts on research methodology, it is clear that this was not an RCT study. Third, the 45% client income gains that Vikram cited twice during the debate were higher than those actually found in the study itself (though not by much, as the researchers stated that microfinance clients had average income gains of 37% beyond what the control group experienced). I will be travelling to India in mid-December and I expect that I will be revisiting some of these issues in the discussions and presentations I engage in while there. Stay tuned! 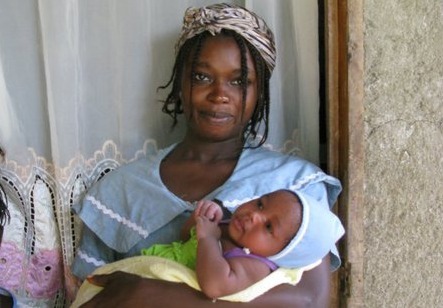 Eleven months have passed since an earthquake devastated the country of Haiti. Many of you made a generous gift to help Haitian families rebuild their businesses and their lives and entrusted Grameen Foundation to carry out this important work. I want to report to you on how we used the funds you provided. Nearly 100% of the $157,000 we raised is now invested in the people of Haiti. Of that, 59% was disbursed within just a few weeks of the earthquake. More than 19,000 microfinance clients of our long-time partner Fonkoze (the largest microfinance provider in the country) lost their homes and/or businesses, driving many of these poor families even deeper into poverty. You made it possible for us to quickly disburse $92,000 to Fonkoze to relocate and completely equip seven microfinance branches that had been destroyed by the quake, and repair three branches that had been damaged. With this infrastructure back in place, money was rapidly put into the hands of people who needed it most in the critical weeks following the earthquake. In fact, Fonkoze’s branches were open for business before the country’s commercial banks. A Way to Save: The poor typically save cash at home, where it is vulnerable to theft, or buy livestock or other tangible goods they can quickly sell, sometimes at a loss, when needed. Thanks to your assistance, Grameen Foundation and Esperanza International, another local partner, funded self-help savings groups in severely affected areas in Miragoaine and Belladere. This program will give 2,250 poor families the opportunity to safely set money aside (in deposits too small for commercial banks) and recover more quickly if they face financial hardship due to healthcare problems, family emergencies or natural disasters. Clean Water to Drink: As the recent cholera epidemic highlighted, inadequate access to safe water sickens – and kills – poor people every day. Unhealthy people cannot work. With your support, Grameen Foundation is partially funding a water-purification system, working with our partner Esperanza International. It is located in the southwest of the island and will provide 5,000 gallons of clean water every day and serve approximately 1,100 people who would otherwise be at risk of drinking, cooking and using contaminated water. This is a pilot project – if it works, we hope to launch many more throughout the country, helping even more Haitians. If you are interested in volunteering, we are recruiting Bankers without Borders™ volunteers for two projects. The first project will develop materials to educate the local community on how to encourage good health and hygiene practices to prevent the spread of cholera, use and maintain the water treatment plant, and protect water as a natural resource. The second project involves evaluating the financial model for the treatment plant and the business processes needed to create either a sustainable business or recoup the initial investment. Please e-mail us using “Haiti” as the subject line if you would like to be notified of these or similar volunteer opportunities. Thank you for your generosity and concern for the world’s poorest.